I was commissioned to create a series of illustrations featuring the hallmark energy device produced by a large medical equipment company. 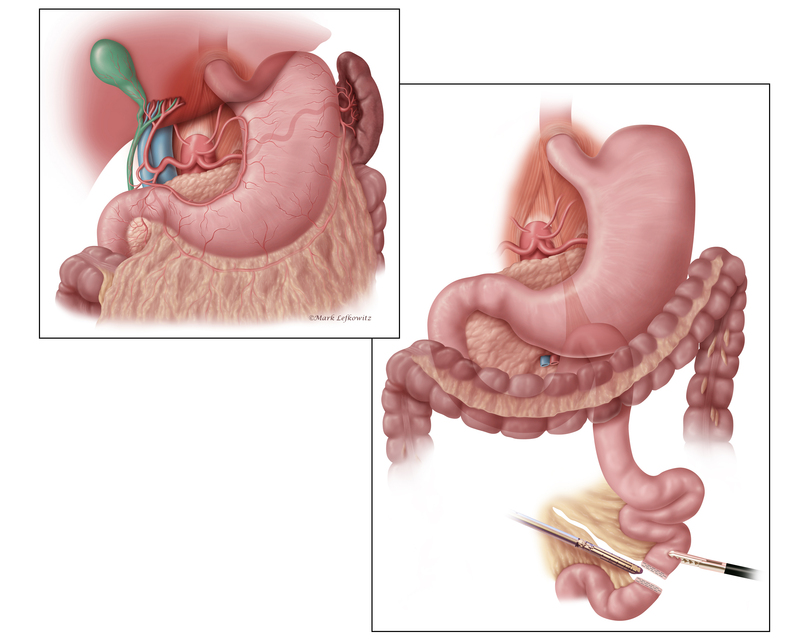 I partnered with different managers to create illustrations focused on their specific surgical procedures. The illustrations were to be used by the company’s sales representatives in PowerPoint presentations and as marketing collateral for prospective clients, including surgeons and hospital administrators. 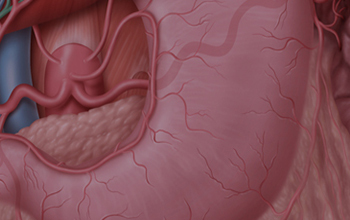 One of the procedures, which involved bariatric surgery, consisted of 11 images. To maintain a unified “look,” I employed a palette and illustration style similar to those I had developed and used in other projects for this company. After an initial meeting and subsequent email communication with the procedure manager, I had a clear sense of the content and design of each illustration in the project. When depicting the stapling steps, it would be important to show surrounding structures in situ, including the underlying posterior body wall and adjacent soft tissue structures. Of particular interest in the surgeries was the ligament of Treitz (the suspensory ligament of the duodenum). After conducting my own research, I consulted with several surgeons and anatomists in my professional network to confirm the exact form and location of this key anatomic landmark. The final illustrations were extremely well received by the procedure manager and his director, and became effective sales tools in the sales team’s presentations. Researching the subject matter is an important skill that I bring to any project. As a Certified Medical Illustrator, I am able to verify the accuracy of references supplied by the client. When needed, I am able to tap experts in my professional networks to provide additional medical and scientific resources.